Among the many pleasures of travel is the opportunity to bring home mementos of your journeys, even doubling your pleasure by giving some to loved ones (and the dog sitter.) It works the same in reverse; taking symbolic, beloved, or impossible-to-find-elsewhere local treats when you travel abroad to thank friends and hosts for their hospitality. BestTrip.TV's producer/host Lynn Elmhirst is Canadian, and here is her list of her most-loved gifts she takes abroad, and recommends as souvenirs to people traveling in Canada. The maple leaf is of course Canada's national symbol and maple syrup can safely be considered the national food. 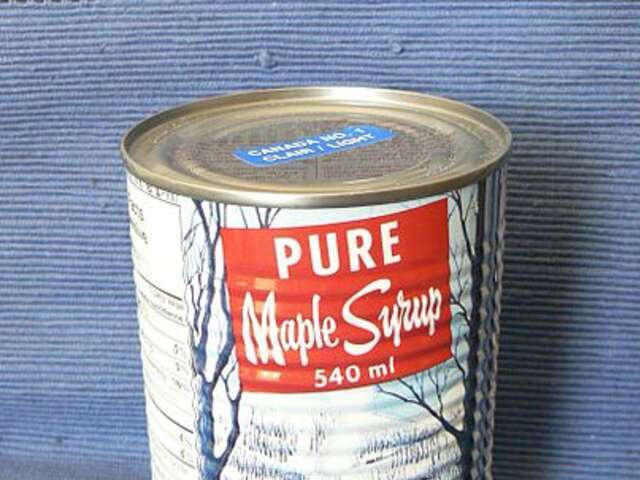 Canada is the world's top producer of maple syrup. 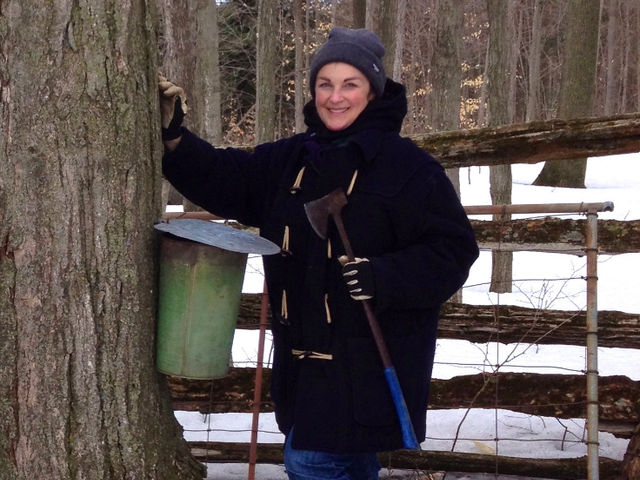 Visitor's Tip: Spring skiing and maple syrup festivals in 'sugar shacks' in rural communities in Quebec and Ontario are probably the two most beloved early spring Canadian activities. It astonishes me when I go abroad that there are people willing to eat a pancake without maple syrup. Imagine that: with a different syrup. In our family, the pancake is really just a delivery vehicle for maple syrup. Only the good stuff will do. 100% pure, and ideally from the source: a local producer at farmer's market. If you've been used to eating maple 'flavored' syrup your taste buds will flinch at the onslaught of deliciousness! Syrup isn't the only way to enjoy the authentic taste of Canada. Other firm favorites are maple candy, and the maple cookie: a sandwich cookie made of two, maple leaf-shaped shortbread-type cookies with a maple cream filling in the middle. Tip: Pack them deep in your luggage or I know you will eat them before you get home. Founded in 1670 to serve the fur trade, the Hudson's Bay Company is North America's oldest continuously operating corporation. Visitor's Tip: These days, 'The Bay' is a department store with nearly a hundred outlets in communities across Canada, including flagship stores in historic downtown buildings in major cities like Toronto that are shopping destinations. 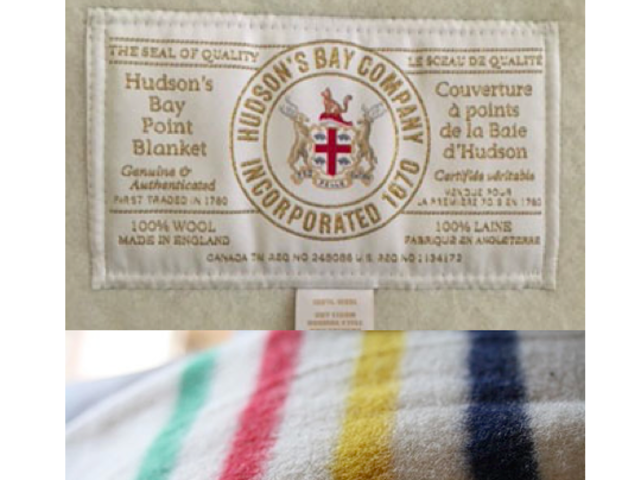 The Hudson's Bay Point Blanket harkens back to HBC's roots in the fur trade. High quality wool blankets were traded for furs from First Nations communities, and the blanket, with its vivid, color-fast stripes: green, red, yellow, and indigo on a white background, became rooted in early Canadian culture. Early Bay blankets have become collector's items, and the Bay now has a whole department dedicated to a line of products in its iconic striped design. Heavy, 100% wool HBC blankets are an investment piece. Like me, you may want to save them for wedding gifts. But the store also carries a line of other HBC products with the iconic stripe pattern that includes fleece throws, wraps, scarves and mittens, totes, house wares like mixing bowls, coasters, and more. Tip: You can also buy a 7500$ HBC canoe, but you'll have to really plan ahead to get that souvenir home. I think of Inukshuk as like leaving a candle burning in the window for those coming home. Above the Arctic Circle, the tundra offers few natural landmarks. So from ancient times, Inuit erected stone Inukshuk as landmarks along travel routes, as way finding for hunters, indicating good places to camp, and generally signaling 'we were here' to those who came later. They may have begun as upright large, single stones (remind you of any other ancient cultures the world over?) But Inukshuk along the way acquired a monolithic human form and deep resonance in Inuit culture. On Baffin Island, there are over 100 inukshuk, and the site has been designated a National Historic Site of Canada. More and more, inukshuk are a warm symbol of Canada at home and abroad, second only to the maple leaf. It was the symbol of the Vancouver Winter Olympics, and it's on the flag of the territory of Nunavut. 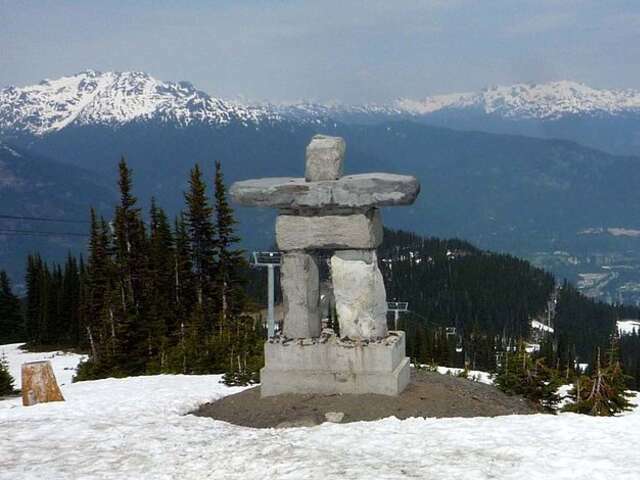 Visitor's Tip: Keep your eye out for powerful and graceful Inukshuk that have sprung up in public spaces across Canada, and also in Canadian spaces abroad; in embassies and consulates, and Canadian projects as a symbol of home. Tip: Don't just give table-top sized inukshuk as gifts. Making your own and talking about inukshuk is a wonderful and memorable craft day with children and teens. Ice wine is a case of making lemonade when life gives you lemons. Freezing winters may not be everyone's thing, but when grapes freeze on the vine, life gives enterprising vintners ice wine. 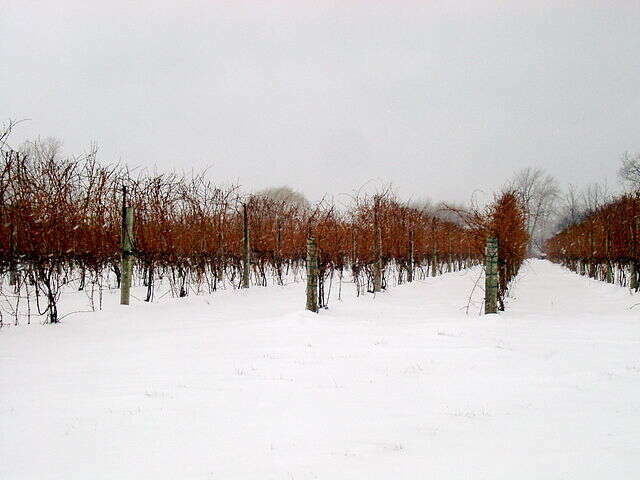 Ice wine can only be produced in countries with wine regions where it gets sufficiently cold. Germany and Austria have a history with ice wine, but Canada's much younger wine industry, with its predictably sub zero temperatures every winter, has become an international ice wine superstar. 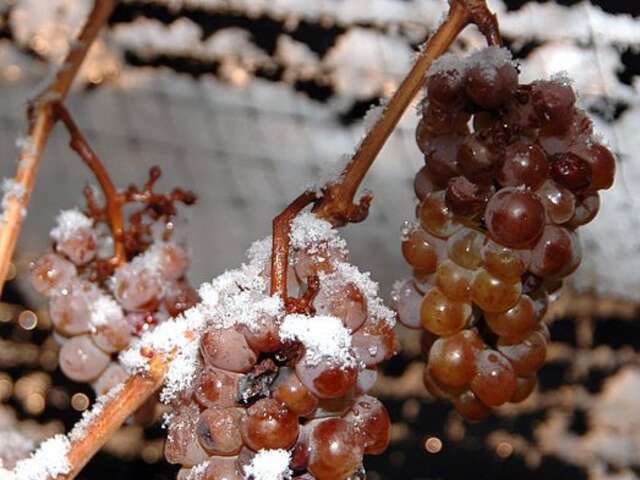 For natural ice wine, grapes must fully ripen on the vine, then undergo a hard freeze (−8 °C (17 °F) or colder). It's risky business. Grapes can be lost before harvest, and then the moment it freezes, pickers have to work at night harvesting all the grapes in a few hours before the sun warms them up again. Visitor's Tip: If you're in an ice-wine producing region of Canada in the New Year, get in on the action of a local ice wine festival. Sometimes you can even be part of the midnight frozen-grape picking, which is more fun than it sounds. What makes ice wine special? When the grapes freeze, the sugars and other solids don't freeze, just the water content. So the juice extracted from the frozen grapes is very concentrated. That has two results: a very sweet wine with a balanced acidity - that can only be produced in small quantities. And it's priced accordingly. Tip: Ice wine's best friend is a simple cheese plate served as a dessert course. Canada has some amazing cheeses too. I have a whole bookshelf devoted to cookbooks I've picked up around the world; browsing through them, I can almost trace my travels over the years. They are among my most treasured souvenirs that recall meeting talented and passionate chefs, food producers and foodies, and of course, all those memorable meals. If that sounds like your relationship with cookbooks and travel too, Anita Stewart's Canada cookbook is one you'll want to add to your destination cookbook collection or give to a favorite foodie. 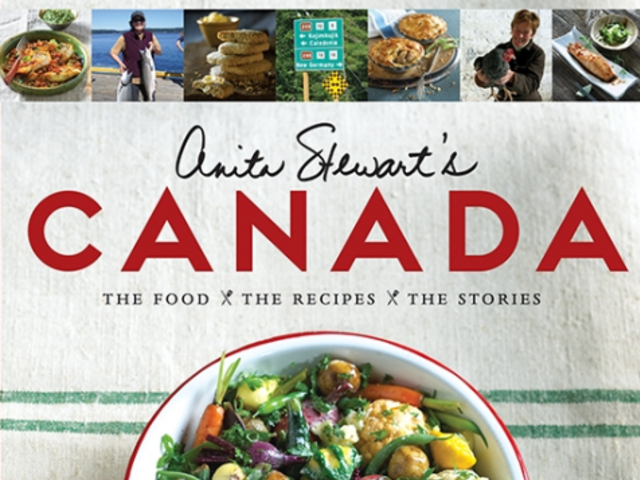 Anita Stewart is not just a cookbook author, she's also a food activist, founder of Food Day Canada, the largest national culinary celebration in Canadian history, and a Member of the Order of Canada. This cookbook is about local food – where 'local' means the diverse regions, seasons and cultural heritage across the second biggest country in the world. Canada's culinary traditions are centuries deep and rooted in cultures around the world and this book is as good a read as it is a visual indulgence and recipe reference. Tip: Have a Canadian dinner party where every guest makes one course from a recipe from Anita Stewart's Canada cookbook. And toast your success with ice wine!